Rieti is the main city of its own province, still today known as Sabina. The city is situated at the center of the Italian peninsula (umbiliculus Italiae), near to the fertile plain of Reatina at the feet of the Terminillo mountains and it is crossed by the river Velino. In the Old Ages the plain was a marsh flowed by the lake Lacus Velinus, that was reclaimed during the Roman Empire Ages, altering the course of the water towards the Umbrian territories, which flow into the highest European waterfall: la Cascata delleMarmore. The region was inhabited since the Iron Age. It was at first conquered by the Sabini, then it became part of the Roman Empire in 290 b.C. with an edit of the Console Mario Curio Dentato. The city developed during the Golden Ages of the Roman Empire and slowly decayed with its decline and suffered the destruction of the Barbarian invasions. In 1178 Rieti proclaimed its own council and was always at the side of the Pontifical State throughout all the controversies over the centuries. An important period of the city's expansion was certainly '200, evidenced by the construction of important civic and religious buildings and the fortified walls. 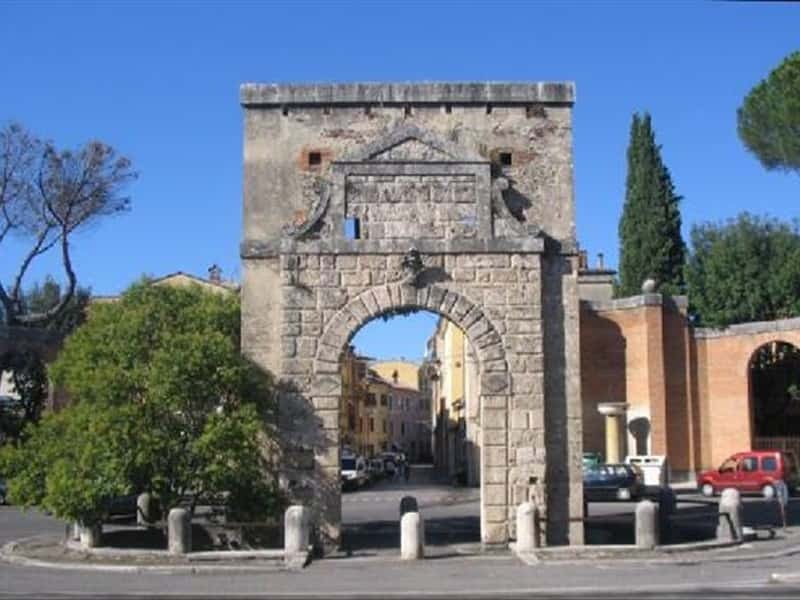 During the XV and XVI centuries the city had to contest with the region of Abruzzo on territorial claims and with the city of Terni for the rights of extraction from the Quarry delle Marmore. In Romanesque style, the Cathedral of Santa Maria Extra Moenia has three naves and a façade a capanna and a splendid portal of '200. Inside the following masterpieces can be admired: a fresco of the artist Antonazzo Romano; a statue of Santa Barbara sculptured by Giovannantonio Mari, probably designed by Bernini and a painting of Andrea Sacchi. The bell tower with arched windows and decorated with clay brick ornaments. Near to the Church arises the hexagonal shape Baptistery decorated with frescos of different periods, that represent the Last Judgment and episodes of the life of Saint John the Baptist. Worth a visit: the Gothic Churches of San Francesco (with frescos of '300), of San Domenico and Sant'Agostino (with a fresco of Liberato di Benedetto daRieti); the Church if San Ruffo ('600), where it is possible to admire a beautiful Caravaggio style painting of Spadarino; the Oratory of San Pietro Martire, full of frescos of the Last Judgment, artworks of the artists Lorenzo and Bartolomeo Toresani (1552-1554); the small Church of San Pietro Martire in Via Molina (a superb wooden and golden ceiling and paintings of Acani Vincenzo Manenti); the Church of Sant'Antonio Abate with a façade designed and completed by Giacomo Vignola; the Church of Santa Scolastica of Francesco Fontana, with paintings of Andrea Sacchi and the Neoclassic Palazzo Ricci of Giovanni Stern. result of the fusion of 2 million and 200 thousands metallic coins of 200 lire and features the Italia turrita (the personification of Italy) which holds a large coin of one lira, the Vespasian Theatre, built at the end of 1800. This town web page has been visited 20,527 times.